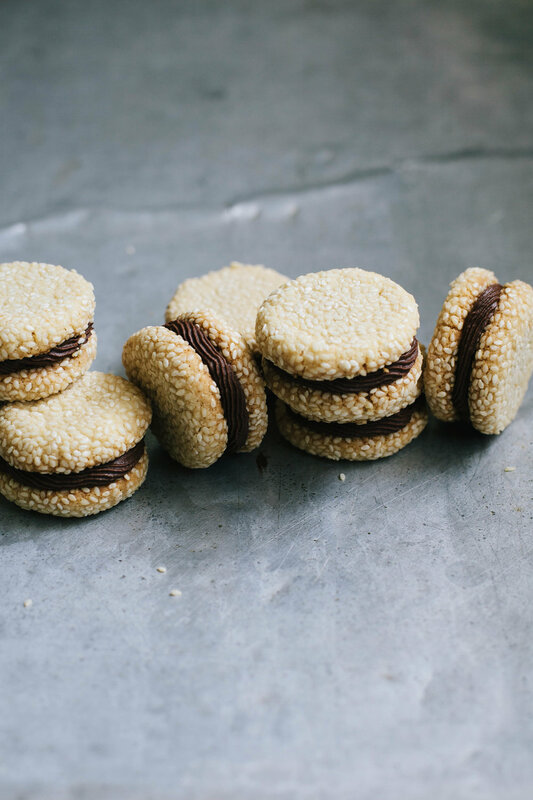 Tahini Cookies — always with butter. In the bowl of a stand mixer, combine the butter, tahini, sugar and salt. Beat the mixture until light and fluffy, 2 minutes. Add the flour and mix until a dough comes together. Wrap in plastic wrap and refrigerate for 30 minutes. Line 2 baking sheets with parchment paper and set aside. On a lightly floured surface, roll the dough out into a 14-inch circle, ⅓ inch thick. With a 2¼-inch round cutter, cut out circles, rerolling scraps as needed. Transfer to the prepared baking sheets, 1 inch apart, and sprinkle with the sesame seeds. Bake until lightly golden, 18 to 20 minutes. Place the chopped chocolate in a large mixing bowl. Heat the cream in a small saucepan over medium-low heat to just under a boil. Pour over the chocolate.Gently stir to combine and emulsify the ganache, do not incorporate any air. Add the butter and stir to combine. Cover with plastic wrap and let chill for 24 hours to set. Pair up all the cookies in twos, finding the best ones that fit together. Remove the ganache from the fridge and gently stir to softened. Place in the piping bag with the tip of your choice. Pipe ganache on the bottom side of 1 cookie in each pair. Top with the other cookie. Store in fridge.